The new Cato Manor is envisaged as a cluster of well-planned, medium and high-density suburbs with the necessary schools, shops, clinics and recreational facilities, close to the city centre and serviced by an efficient transport system, where families can make their homes and gain access to employment. The challenge is to provide as broad a range of housing as possible, to ensure that it is affordable to low income earners, to achieve economies associated with large scale delivery and to avoid the vast, monotonous, unsafe and environmentally unsustainable housing estates that have characterised low cost housing in the past. The proposed road network and public transport system is aimed at providing high levels of mobility and accessibility within Cato Manor and within the rest of the metropolitan area. As the focus is on a road-based public transport system (bus and taxi), it is imperative that a public transport-minded culture be encouraged in Cato Manor from the outset. This can only be achieved through the provision of an efficient, effective service. The provision of a full range of social facilities, including schools, libraries, clinics, community halls, religious sites, urban parks and sports fields, is planned. These is being delivered in an appropriate and affordable manner that contributes to the goals of compact city form and integration with the rest of the metropolitan area. Facilities provided in Cato Manor are be planned purely to serve the needs of Cato Manor residents but to provide for the entire metropolitan community. The provision of roads, electricity, stormwater drainage, waterborne sewerage, water, post-boxes and telephones are taking place. Locational advantages within the metropolitan area are creating significant opportunities for the development of industrial and commercial enterprises. These are situated within the area along activity streets and within defined nodes. Whilst larger enterprises are being encouraged to invest in the area, attention is also being given to the promotion of local and emerging small, medium and micro enterprises. A Tourism Development Programme to promote job creation and to preserve the rich cultural heritage of Cato Manor is being developed. Innovative planning and close liaison with community representatives and relevant departments of the Provincial and Metro Government has resulted in the development of a Multi-Purpose Centre concept. This combines specific social facilities, thereby reducing duplication and concomitant development costs (capital and running costs) while increasing the accessibility and levels of utilisation of the facilities. Both the Umkhumbane Multi-Purpose Centre in Old Dunbar Rd (RDP funded) and the Cato Crest Multi-Purpose Centre in Trimbourne Rd (EU funded) illustrate this unique concept, where primary and secondary educational facilities have been combined at the planning and implementation stages, with a community hall, a public library and a sports field to create an integrated and highly cost effective complex. Here all the facilities will be combined through a joint management philosophy which will promote the shared utilisation of the facilities by school users and the surrounding communities. Through large scale public works projects and attention to RDP principles such as the use of local labour, support for emerging contractors and an active community development programme, an opportunity exists to significantly improve the capacity of participants at a range of levels of expertise. Ensuring that land is made available to the homeless and landless segment of the metropolitan community in a just and efficient manner has to be balanced with the development of appropriate responses to the compensation and restitution issues involving those who were removed from Cato Manor during the apartheid era. 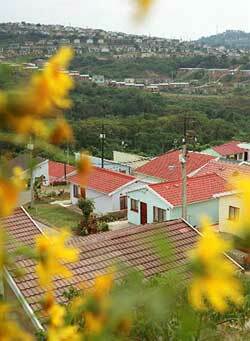 Cato Manor is a crucial link in the maintenance of the overall Durban Metropolitan Open Space System (D-MOSS). The planning for Cato Manor has therefore encompassed a concern for conservation, the sustainable use of the natural resource base and the quality of human life. A key development parameter is that Cato Manor is to be fully integrated into the rest of the Durban metropolitan area. The CMDA has a Resource Centre at it's offices where documents pertaining to development and related issues can be borrowed on a short loan basis. Please contact S. Cele at (031) 261 6640 should you wish to access this service.